Whether you are looking for a quick pick-me-up between rides or a small meal, these great snacks can't be beaten. Disney offers a variety of fun and unique food items, including frosty drinks, sweet pastries, and savory drumsticks — many themed after your favorite movie characters — so you'll never go hungry at the parks. Woody's Lunch Box in Hollywood Studios' serves all the childhood favorites you wish your mom had packed you for lunch — including square toaster pastries, Disney's rendition of Pop-Tarts. These versions are thicker and flakier than the supermarket staple, with two flavor choices: chocolate-hazelnut, topped with icing and crispy, caramelized bacon; or raspberry, topped with a thick coating of frosting and candy pearls. Where would you expect to find a tiger cookie or other animal-inspired sweet treats in Disney World? At Zuri's Sweet Shop in Disney's Animal Kingdom, of course. These very sweet, but oh-so-good treats are a big hit with kids and are included in the Disney Dining Plan. For the uninitiated, funnel cakes are made from sweet dough, drizzled into the fryer and cooked to crisp perfection. You can have your cake plain or topped with confectioner's sugar or fruit syrup. This snack is included in the Disney Dining Plan. Note: There is also a funnel cake stand in Epcot, but funnel cakes at this location are not included in the Disney Dining Plan. Fresh-popped popcorn is available every day at each of the Disney theme parks. If you are used to microwave popcorn, then Disney's fresh, oil-popped corn will be a real treat! Boxes are the perfect size for a snack, or to share with a friend. This snack is included in the Disney Dining Plan. Churros are foot long "sticks" of fried dough, rolled in cinnamon and sugar and have a crisp, satisfying texture. Churros come wrapped in paper for mess-free eating, but grab some napkins, just in case. Churros can be found at Dino-Bite Snacks, and at the Harembe Popcorn Cart in the Animal Kingdom. This snack is included in the Disney Dining Plan. You can find a sweet cookie and cream ice cream sandwich at just about any ice cream cart in Disney World. 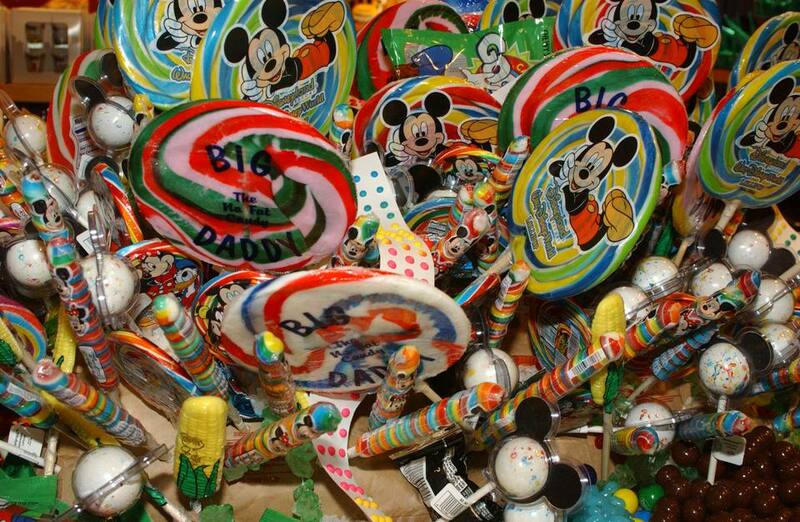 Not only is this item a sweet treat—it is shaped like everyone's favorite mouse! Break off an ear for easy sharing, or keep the whole thing to yourself for a cool summer snack. This snack is included in the Disney Dining Plan. If you are in the mood for a substantial, savory snack, then look no further than the nearest turkey leg cart. Each enormous drumstick is smoked to perfection and makes a great snack or small meal. Feeling carnivorous? Tear into one of these as you wander through the Animal Kingdom and get in touch with your wild side. This snack is not included in the Disney Dining Plan. Pick up one of these giant-sized pretzels for a true taste of Germany. Perfect for big appetites or for sharing with a friend, you can enjoy a plain pretzel or one with side sauces or dips. This snack is included in the Disney Dining Plan. Snow White herself couldn't resist these hand-dipped confections, and neither will you! Large, ripe apples are hand-dipped in caramel, then rolled in crushed nuts or candy for a sweet, crunchy snack. Don't like caramel? They offer a red candy apple version as well. This snack is included in the Disney Dining Plan.